Necn's Ally Donnelly investigates the safety record of Bolt Bus in the wake of a massive bus fire Monday on the Massachusetts Turnpike. The Federal Motor Carrier Safety Administration oversees the bus industry. 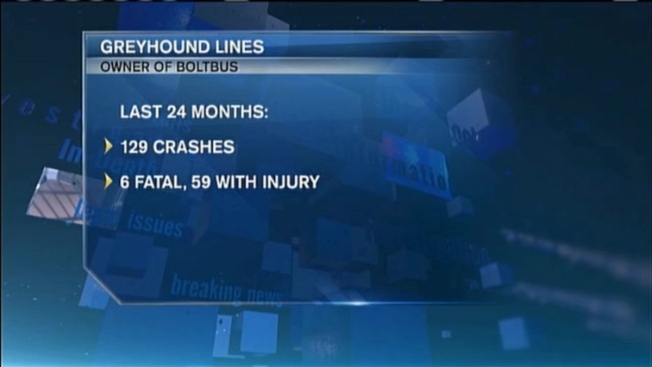 It lists companies and their safety ratings on its website, but Bolt is owned by Greyhound and the FMCSA does not distinguish between the two in their online records. Also in the northeast, Bolt is operated in a partnership with Peter Pan. Greyhound has a satisfactory safety record. They have 1,433 vehicles, 2,479 drivers, and have been inspected 4,301 times in the last couple of years. Greyhound received its latest full inspection of its fleet in September of last year. According to the FMCSA, in the last 24 months, there have been 129 Greyhound crashes- six of them have been fatal and 59 injuries were reported. It is unknown how many of these buses were part of Bolt bus. A Bolt bus was involved in a fatal crash in 2012 in Delaware when it collided with a car that had reportedly veered into its lane and then in 2013, in New Jersey, a Bolt bus went down an embankment and 14 people were hospitalized. In Massachusetts, Bolt also has about ten speeding violations in the last two years- several for going more than 15 miles over the speed limit. After years of lax oversight in the industry, a nationwide crackdown put more than 100 companies out of service, including Boston's Fung Wah and Lucky Star bus lines.